This run was huge. 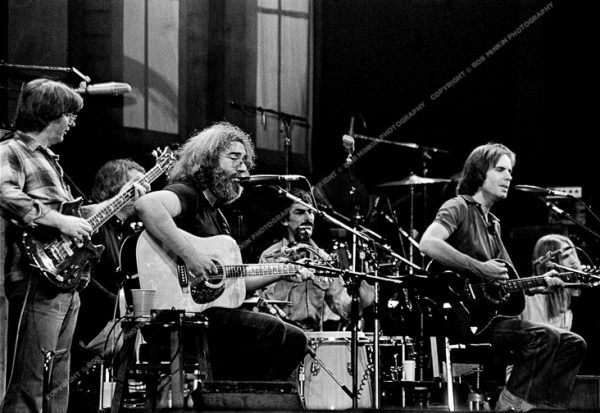 For the first time in a decade, the Dead were going to incorporate an acoustic set into their show, followed by two electric sets. The tour opened with fifteen nights at the Warfield Theatre in San Francisco, followed by two shows in New Orleans. It wrapped up with eight nights at New York City’s gleaming art deco palace, Radio City Music Hall, culminating on Halloween with a broadcast on radio and closed-circuit TV in a few theaters. I had to sleep out on the street along with hundreds of other Heads to get a good place in line when tickets went on sale. I scored four nights’ worth. Most of the photos here were shot at the October 30th show. I had no official access, but luckily the security guard by the stage was very cool and let me shoot as much as I wanted to.